Television shows about ghost hunting have been popular for over 50 years, and though the basic concept is the same, recent decades have seen the hunt become less about psychics and séances and more about electronic detection gear. Just about every TV show about ghost hunting sends a crew of investigators into a building, armed to the teeth with all sorts of equipment. The use of any kind of measuring equipment to detect ghosts is fundamentally, and completely, bogus. How can I make a blanket statement like that? Measuring equipment detects what it is designed to detect, whether that’s light, heat, electromagnetism, or whatever. Thus it will only detect things that emit measurable amounts of those energies. For us as viewers to accept that some piece of handheld measuring equipment has a useful function in detecting a ghost, we must base our acceptance on the premise that ghosts are known to emit those types of energies in measurable amounts. If there were any truth to this, science would have discovered it long ago. Hospital operating rooms would have ghost detection equipment built in. Mortuaries and crematoriums would have ghost detection equipment at the top of their list. Search and rescue crews would use ghost detection equipment. If ghosts did exist and were detectable, you can bet that there would be huge industries behind it. I can’t think of anything that would attract more venture capital dollars from Silicon Valley. However, no rigorous research has ever shown that ghosts can be reliably detected with hardware. It’s easy to disbelieve me, but it’s much harder to disbelieve the lack of interest from greedy corporate America. 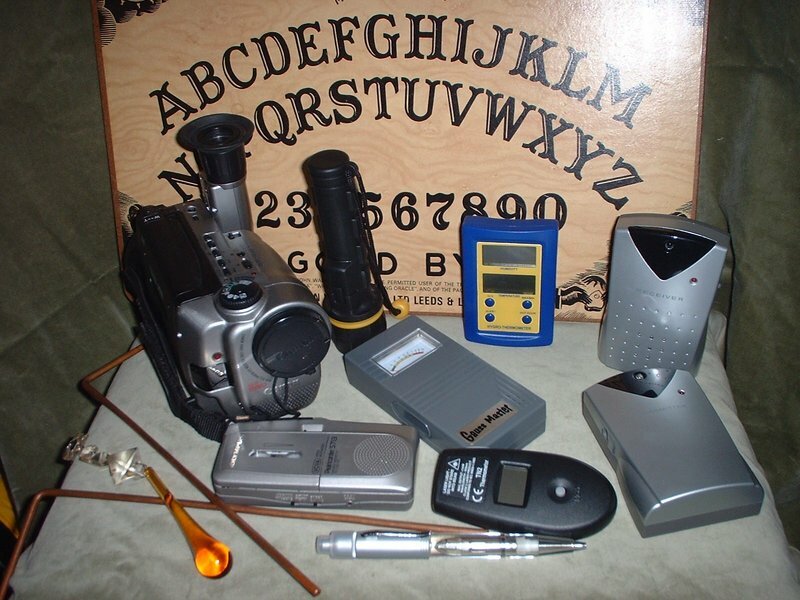 So now let’s look at the popular tools of the trade of ghost hunting. The important takeaway is to understand what these devices are actually detecting when the ghost hunters point them around the room, and why their crazily jumping needles and indicators are perfectly consistent with, and explained by, the absence of ghosts. Infrared thermometers are the most blatantly misused of the ghost hunting tools, so are a great place to start. These handheld devices measure the temperature of the object they are pointed at. They work exactly like your vision, except that they are sensitive to far infrared instead of the visible spectrum. They measure surface temperatures, just like your vision measures surface colors. If you can see something, an IR thermometer can measure its temperature. However, ghost hunters use these devices to detect what they believe are cold spots in rooms. IR thermometers are not capable of detecting something without a visible surface. In fact, an IR thermometer is even less likely than your vision to see a hazy apparition. Firefighters use infrared because the longer wavelengths of infrared penetrate smoke more effectively than the shorter wavelength of visible light; so if there were a hazy invisible apparition floating in the middle of the room, infrared is perhaps the worst technology to detect it. Variations of IR readings inside a room are merely showing temperature gradations on the walls, caused by heating and AC, insulation variances, studs, wiring, or pipes behind the wall, radiant heat, recent proximity of another ghost hunter, sunlight, temperatures in adjacent rooms, or countless other causes. Infrared motion detectors work on the same principle. If the amount of IR radiation striking the sensor changes, an alarm can be activated. Such a change is caused by a sudden change in temperature within the detector’s field of view, or a significant movement by an object with a visible IR signature. A ghostly cold spot moving within a room could not be detected, unless it also cooled the walls or floors enough to trip the activation threshold. Particle detectors are devices that measure ionizing radiation. The most common particle detectors are Geiger counters, also called halogen counters. These work by measuring cascade effects caused by incoming particles that strike molecules of halogen gas inside the detection chamber. Typically, alpha, beta, and gamma particles are detected by these. It’s not the most common of ghost hunting tools, but occasionally you will see someone pointing a Geiger counter around the room, though you may hear them describe it by any of several fancier and more high-tech sounding names. It’s a Geiger counter. For a ghost to emit ionizing radiation, it would have to be an awfully sick ghost; or be composed largely of unstable radioactive metals. Ionizing particles don’t just appear out of thin air, they are emitted by the decay of unstable isotopes that are typically heavy and have significant mass. EMF meters are perhaps the favorite tools. EMF meters detect electromagnetic fields, and are used in ghost hunting on the premise that ghosts emit electromagnetism, though this claim is rarely supported by any suggestion of what the power source might be. There are many different types of EMF meters. More affordable units, such as those typically used by television performers, need to be held precisely for a period of time at each of the three axis to get a reading, and so they are clearly not used on television in a manner that would produce any useful result. When they are, or when a more expensive three-axis meter is used, they are designed to detect the operation of electrical appliances or wiring. Ghost hunters are usually thoroughly accessorized with every electronic gizmo under the sun: radios, cell phones, flashlights, cameras, TV cameras, and other ghost hunting accessories; and all of these will produce a result on the EMF meter. Building wiring or appliances will also be detected. But, even in an environment with no electrical devices at all, the presence of the TV camera alone renders the EMF readings totally useless. Even without ghost hunting equipment, electrical wiring, or a TV camera, a sensitive meter can even detect the oscillation of a steel filing cabinet vibrated imperceptibly by footsteps. In the midst of all the absurd amounts of EMF pollution on a TV ghost hunting set, the pretense that the alleged EMF field of a ghost (who’s not carrying any batteries) can be identified, is foolish. Ion detectors are interesting animals. The few commercially available ion detectors are available online almost exclusively through ghost hunting and alternative wellness web sites, which gives some clue of how useful they actually are. Ions occur naturally in the atmosphere from a variety of sources: solar radiation and weather being the main ones. Also, if you go to a part of the country where radon gas is an issue, an ion detector taken into the basement can go crazy sensing airborne ions created by radon decay. Ghost hunters prefer to regard this reading as indicative of the presence of a ghost. Ion detectors can also sense the presence of static electricity, so if your ghost is carrying a large static charge, you ought to be able to see it scuffing its shoes across the carpet. Cameras of different types are used by ghost hunters. Sometimes they’ll take a conventional visible spectrum camera and snap away, in the hope that spirit orbs or other manifestations will appear on the processed film. Since this phenomenon has already been thoroughly discussed in our episode on orbs, there’s no need to repeat it here. Suffice it to say that all such images are well established artifacts of photography and of cameras, and well understood by knowledgeable photographers. They happen every day in photographs that have nothing to do with ghosts. Near infrared photography is the monochromatic “night shot” video that you see all the time, and that your home video camera probably offers. The light source is an infrared bulb on the camera, similar to the invisible light source inside your TV remote. These cameras record only what near infrared light is reflected from the subject, and of course they also record other near infrared sources, which are relatively common. Far infrared photography is the thermal imaging discussed previously. It’s simply a visual display of the same heat sources detected by IR thermometers and motion detectors. Dowsing rods are probably the least controversial of ghost hunting tools, in that increasingly few people accept that they have any useful function. Yet ghost hunters still employ them. And why not? A self-described psychic’s untestable verbal reports are under the psychic’s complete control. They cannot be tested, measured, or duplicated by others — they say only exactly whatever the psychic wants to say. Dowsing rods simply give the dowsers another way to communicate whatever they choose to communicate. Since the rods are held in the dowser’s own hand, they move only when the dowser wants them to move, and do not move when the dowser doesn’t want them to. No form of dowsing has ever passed any type of controlled test, and no dowser has ever proposed any plausible hypothesis suggesting that dowsing might be an actual phenomenon. It is among the most childish of pretended ghost detection methods. The only thing you can learn from dowsing is which way the dowser wants to swing his dowsing rods. Audio recording gear is used when the ghost hunter hopes that EVP. or electronic voice phenomena, will appear on the recording. EVP’s are discussed often enough to warrant their own Skeptoid episode, and we’ll be discussing them in detail in the future. An EVP is said to be the voice of a ghost, and the claim is that ghosts can talk perfectly well but can only be heard on an electronic recording. This means that recording gear has the ability to convert inaudible frequencies into audible ones. Engineers do not design this capability into most recording gear, since a change of frequency of perhaps tens of thousands of hertz would render all recordings completely useless and horrible to listen to. So, like they tend to do with all the electronic gear they carry, ghost hunters completely misunderstand, misuse, and mischaracterize the functions of these instruments. When you turn on the television and you watch people pointing their gizmos around the room, acting all dramatic and pretending to detect ghosts all around them, any intelligent adult should laugh out loud. Or better yet, change the channel. Of course an intelligent adult should be free to watch whatever they want, and that’s fine — but one place I will draw the line is the point where you let your children watch one of those shows and allow them to accept the silly claims as fact. Watch it and enjoy it as entertainment, if you find those people truly engaging and clever enough to be entertaining; but please, explain to your kids the science behind what they’re seeing. Or, as the case may be, the lack of science behind it. sounds like a lot of sour grapes to me, as you are absolutely wrong in your “Sheldon Cooper” assessment of “ghost hunting.” Have a nice day! He’s 100% correct in all that he’s saying Mark. These devices do exactly what they are designed to do and that’s it. To lie about what they are doing falls in the lap of people who claim to be using real science in what they are doing. Which is apathetic. Can you explain the EVP’s a bit more thoroughly? I’m not sure I understand that part :). I Agree The “TV verison” of Ghost hunting is bull. and most of what people say is nothing more than hysteria fromed by some half-wit. Untill you can show me a ghost or something other than wind, that would suggest the exsistants of something paranormal. any how when you die you die your body and the energy created by it dies. thats it. nothing else. nomattery what is done here you cant change it. if you could im sure the ghost of Albert Einstein, Nikola Tesla, or Benjamin Franklin Would have figured it out already and proved me wrong. Again, he explains this very clear. The device you are using to record is designed to do ‘X’. The vast majority of devices people use record what your ears can hear. Period. evidently you havent captured real evps or ghost on photos just a sort of analyzer/commentator. I’m not understanding this site at all. You post pictures and stories of ghosts and want people to share ghost stories, and then you say here, basically, that ghosts don’t exist. What is it you’re trying to do with this site? Share ghost stories, or call everyone who has experienced ghostly things liars? The site is for all things paranormal, spooky, horror, whatever. To share stories and opinions, etc. this wasn’t something we wrote, but a repost from another site. Ah. Interesting thing to post, given the theme for the site. I missed that part of it, at the bottom there. Thanks for clarifying. I personally experienced some unexplainable events about 25 years ago when I lived in a house built in the late 1800’s in the historic district on the west side of Hamilton,OH. I never saw any “ghosts” but can’texplain these events. There was no one else around that could have been playing practical jokes either. I am a skeptic also. First incident: 1/2 bathroom off the kitchen, several times with various people in the kitchen. The faucet would turn on near full force requiring someone to go in the bathroom and turn it off. Second incident: my wife at the time was OCD about certain things, one of them being all the dining room chairs must be pushed into the table. I was heading into the kitchen to get a coke one evening. I saw a chair slightly back from the table and pushed it in. I decided to step back into the family room and ask my ex-wife if she wanted anything, turned and started heading back to the kitchen and all four chairs were sitting exactly 11/2 feet from the table. I was totally shocked! In a matter of seconds the chairs were all moved back exactly the same amount from the table. It would have been impossible for anyone to do that, that quickly. Third incident: The stairs going to the second floor where my bedroom was had very distinctive sounds when someone was coming up the stairs. I was living by myself at this point. My ex had moved out and I was the only “person” in the house. Three nights in a row, lying in bed, not sleeping yet and I distinctly heard someone coming up the steps. I would ask who was there with no answer and no one answered. I would go turn the light on when someone should have been near the top based on the creeks and no one was there. The third time I yelled and said, “Get out of my house, now!! !” and the sounds never occurred again. There were several other incidents that were encounted by myself and others, but I really do believe that house was haunted by something I couldn’t explain. One more comment. These memories are still very vivid to me today, even though so much time has passed, since i couldn’t explain them and they disturbed me so much. I have never experienced anything else again.